This new Tavern series started from a comment on our recent Patreon post from our Patron Kory Cerjak. If you have an idea for Tavern content, head here to let us know. Our Patreon campaign is a great way for you to contribute to keeping the Tavern going and growing. It’s a smaller community where you can interact with the Tavern writing crew and get involved with the different stories, interviews, and podcasts we’re working on. If you haven’t seen our page yet, take a look and let us know what you think! This series idea has been cooking at the Tavern for a while and I’m really excited to share it with you. This series will be a way for you to keep an eye on the form of Korean players playing around Europe and Asia. Like a stockbroker, we’re going to tell you which players are Trending Up, Trending Down, and who’s On the Radar to replace players who are losing form. Hopefully we’re going to be able to keep a good pulse on the Korean players and see if we can predict the KNT squad list for friendlies and major tournaments! For this first edition, I’m going to compare Bento’s first 2 squads and see who’s Trending Up, Down, and who’s On the Radar to come into the squad in November (for my thoughts on the first squad, click here). Let’s have a look! It’s going to take a lot to change these three goalkeepers at the moment. Jo Hyeonwoo, Kim Seunggyu, and Kim Jinhyeon are three established goalkeepers that the coaching staff at the KFA really trust. Right now, Jo has returned from injury and is straight back to making really strong saves in the K League for the resurgent Daegu FC. He will surely get his first start under Bento. The two J League Kims are veterans that have performed well in the past and it’s going to take a lot to unseat them. All three of these goalkeepers are Trending Up. On the Radar: During this K League season, there has been some standout GK play that could lead to call-ups to the national team in the future. We all talk about Song Bumkeun and how he has won the starting job at Jeonbuk in his rookie season. With military exemption and a gold medal around his neck, will European scouts take more notice of his play and offer him a contract in Europe? He’s already received one senior call-up and more should be on the way soon. Kang Hyeonmu has been consistent for Pohang this season and up until the emergence of Jo was thought to be the sure starter at the Asian Games. In addition, Shin Hwayong has been enjoying a spectacular run with Suwon Samsung Bluewings this season. He has led them past Jeonbuk on penalties in the AFC Champions League Quarterfinals and should definitely merit a call-up if he can be a part of a Champions League win for Suwon. Trending Up: Kim Younggwon, Jung Seunghyun, and Kim Minjae are the three center-backs in this squad who look set to be mainstays in the KNT for the foreseeable future. Kim Younggwon and Kim Minjae have shown a great ability to read the game and get into the right position to make strong tackles when needed. Especially in the World Cup, it seemed as if Kim Younggwon was everywhere he needed to be and repeatedly made crucial blocks. Jung Seunghyun is enjoying a consistent season where he is starting at center-back for Kashima Antlers in their AFC Champions League run. This kind of experience can only help him develop as a player and it’s good to see him consistently finding a place in the KNT squad. The new face at center-back is Park Jisoo, a consistent performer for the K League’s surprise package, Gyeongnam FC. At 24, he’s a more youthful option than Yoon Youngsun from Seongnam FC, the player he replaces in this squad. 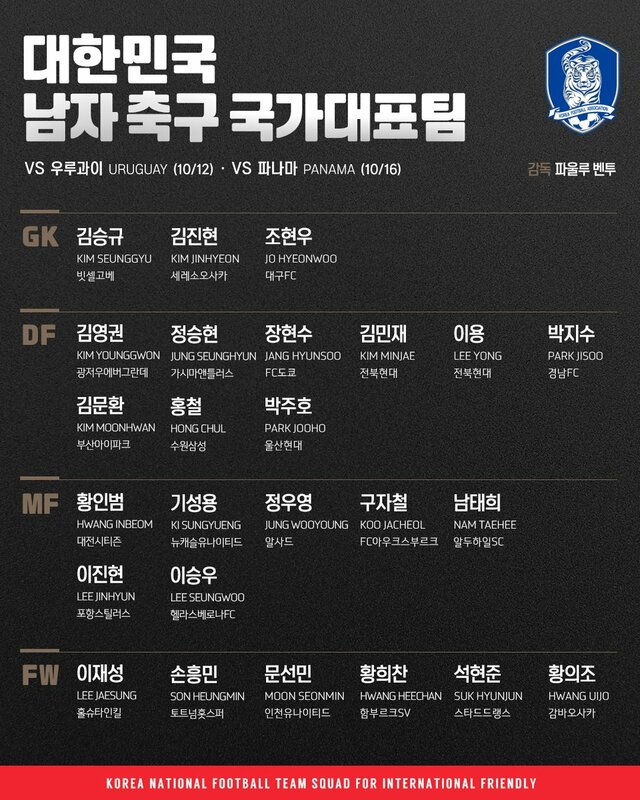 We’ll see how Bento uses him in these friendlies but just seeing a Gyeongnam player named to the squad is a welcome sight. At right back and left back, we have the options of Kim Moonhwan, Hong Chul, Lee Yong, and Park Jooho. Park Jooho was picked over Yoon Sukyoung from the last squad because Bento remarked that Park has great technical ability and can be used in a variety of ways tactically. Trending Down: I have to say this. It seems to be that Jang Hyunsoo is running out of chances. Bento was asked specifically about Jang’s mistake in the match against Chile. He remarked that all players make mistakes and that Jang’s performance across the two friendlies actually was good. This was a sensible comment for Bento to make because it should give Jang confidence that Bento backs him in this squad. However, if the mistakes keep happening how long will Bento continue to back Jang when there could be other options for him to select? On the Radar: Kim Jinya from Incheon United will be waiting for his call in November. After an Asian Games performance where he was a menace at left back and played in every match, it seems to be a matter of time before he joins Asian Games teammate Kim Moonhwan in the senior squad. Kim is a left winger/left back who has the attacking technique and work rate to function in Bento’s system. In terms of center-backs, it will be interesting to see if past KNT players like Kim Kihee from the Seattle Sounders or Hong Jeongho from Jeonbuk can earn a recall to the side. Another name that deserves a mention is Kwak Kwangseon, the veteran Suwon Samsung Bluewings center-back who has been a huge part of their success this season. Trending Up: Ki Sungyeung, Hwang Inbeom, Jeong Wooyoung (Al Sadd SC), Lee Seungwoo, and Nam Taehee have all kept their place in Bento’s midfield selections. Koo Jacheol unfortunately had to drop out of the squad due to injury and he will be replaced by Kim Seungdae from Pohang Steelers. With his club teammate Lee Jinhyun earning his first senior call-up, it makes sense to also include Kim Seungdae, who has also been on good form as Pohang have surged up the table this summer. On the Saturday before Bento announced this squad, Lee Jinhyun scored and assisted in a 2-1 victory over Daegu. It certainly had to make an impression on Bento! Trending Down: Joo Sejong was dropped from this squad and it could be said that with Ki figuring to play a role in the KNT through the Asian Cup, we won’t see much more of him. Bento definitely saw him in training and could surmise that he offers many of the same skills that Ki already has but doesn’t have the veteran experience that Ki has. Koo Jacheol has been part of the KNT midfield for a while but it could be said that his injury struggles may mean he’s coming towards his international retirement. If he can’t get healthy enough to make the November squad, it might be hard for Bento to justify his inclusion in the Asian Cup squad. On the Radar: Someone from Ulsan’s midfield surely deserves a call-up soon. After an indifferent start to the season, Ulsan Hyundai have shot up to third place and have been scoring a lot of goals. Both Han Seunggyu and Hwang Ilsu deserve a shot at cracking Bento’s November squad. Check out some of Ulsan’s highlights, they’ve been very fun to watch! Also, if we’re talking about the midfield of the future, it will be interesting to see when Bento decides to bring Lee Kangin and Paik Seungho into the senior ranks. Both have (or in Paik’s case, arguably “had”) that hype surrounding their talent from their youth background in Spain. Trending Up: Lee Jaesung, Son Heungmin, and Hwang Heechan will be mainstays on the forward line for the foreseeable future. Hwang has adapted really quickly to life in the 2.Bundesliga and is already winning plaudits for his stellar play at Hamburg. If he can be a part of a promotion push and maybe earn a permanent transfer to Hamburg or a Bundesliga side, the sky could be the limit for him. Trending Down: Moon Seonmin, even as he keeps pouring in the goals and assists for relegation-threatened Incheon United, would seem to be running out of time in a KNT shirt. While he has the tactical awareness to make dangerous runs and finish/create chances, he has yet to show that he can do this at the international level aside from a goal against a weak Honduras side. Instead, what we usually get from him is tentative misplaced passes, dribbling into traffic and losing the ball, and not being able to get a shot off quickly enough when given the opportunity. He’s a stalwart for Incheon United but that might be the ideal situation for him and it has yet to be seen whether he is an international-level player. On the Radar: Suk Hyunjun, Hwang Uijo, and Ji Dongwon should firmly be considered as trying to impress Bento enough to include them in his Asian Cup plans. They have all been in and out of the squad in the past few years and have yet to cement themselves in the KNT setup. However, they all have shown flashes of having the right abilities to partner Sonny up top along the forward line. Hopefully we can see one of them really stake a claim to a starting spot in the coming months. On the youth front, Jeong Wooyoung is slowly making his way through the ranks at Bayern Munich (!!!!!) and could star at the U20 World Cup next summer. Will he score enough goals in the coming months to turn the eyes of Bento? Also, will youth stalwarts like Cho Youngwook, Lee Keunho (Pohang Steelers) and Jeon Sejin find consistent K League minutes and goals to merit a call-up soon? These are just some of the names that Bento is looking at to include in his squad. I’ll be back next week to give a quick rundown of who improved their stock during this international break. Get active in the comments with names I may have missed as well as your thoughts on this new series! I just wanted to apologize for the delay in this post. Been meaning to get it out but recently started a new full-time job so just been adjusting to my schedule a bit lately. Finally feeling ready to get back into that writing groove. Hope you guys enjoy this new series! I appreciate the post and I love reading the articles posted on the tavern! Thank you guys for taking your time to update us on korean soccer news! Much love and respect from SoCal. -We’re looking into the Twitter feed on our website. We think there’s a WordPress bug so hopefully we can get that fixed soon. -In terms of an app for our website, that’s going to be a future project for us when we can bring in someone with that technical expertise through our Patreon campaign. Thanks for the idea! Hopefully we can make it happen in the future! Thanks so much for reading our site! THE TWITTER TIMELINE IS BACK! I HAVE FIXED IT! it’s about dang time Suk got a call up. No mention of the Wookie on the Tavern this time around? I don’t think the Wookie is remotely on the radar of Paulo Bento. Do you know what’s been going on with Kim Young-gwon? I heard he hasn’t been playing much lately for his club. Let’s hope he’s not at Guangzhou Evergrande much longer. Looking at the CSL rules, you can only play 3 foreign players in each match (and Kim counts as a foreign player). Right now, Guangzhou Evergrande is playing 3 of their 4 Brazilian players in each match. In addition, a CSL club can only have a maximum 4 foreign players in the 1st team squad at any time. Right now according to Wiki, Kim Young-gwon is on their reserve squad because they have 4 Brazilian attackers registered. Kim’s contract runs until next summer but I really hope he can get a loan/transfer during the winter transfer window, because clearly Guangzhou have no plans to play him anymore since they’ve demoted him to the reserves. Like Hong Jeongho, it would be possible for a K League club or a foreign club to get a loan with an option to buy in the winter transfer window. Other than Kwon Kyung-won, it looks like the CSL has moved on from giving Korean players consistent playing time. Yeah I hope he can move to another club as a soon as possible. I wonder if he could move to Europe after impressing at the world cup. If I had to guess how Kim Younggwon’s transfer will play out, I would think he returns to Korea first to start the 2019 season. What we’ve so far seen with the CSL in general is that very few players transfer out of the CSL to Europe. Even Paulinho was only loaned to Barcelona. I think Kim Younggwon will have to get a contract with a Korean club that will allow him to transfer to Europe or leave on a free transfer once his Guangzhou contract ends. However, I think he will push for at least a loan this winter to get playing time at the 1st team level. At the beginning of the season he was part of the Guangzhou 1st team and he was only demoted after the summer transfer window it seems. The good news for now is that last month he didn’t appear to be rusty at all so I had no idea he was only playing reserve matches!